The other morning I went to plug in a piece of equipment on my work bench. It needed a standard IEC-type power cable. My workshop, like many others, has a box in the corner containing an assortment of such power cables. I can’t remember where most of them came from, and I just grabbed the first one. It seemed rather short, only about one metre long. That didn’t matter for this job. But I noticed that the insulation was damaged near the IEC connector. Oh dear. That makes the cable unsafe to use, so I set about destroying it before throwing the parts away. My usual technique for that is to put one foot on the plug and pull hard, tearing the cable out and rendering the whole thing unusable scrap. But I got a surprise: the cable more or less came apart in my hands! Where on earth is the mains wiring colour code blue, black and black with a turquoise stripe? Not anywhere in Europe, that’s for sure. I looked further, taking the fuse out of the plug. Sharp-eyed readers will already have noted that the fuse is rated at 3A but coloured brown. That’s an oxymoron: under the British Standard BS1362, 3A fuses are red and 13A fuses are brown. So which was this one? It certainly doesn’t comply with the standard in spite of the ‘BS1362’ written on it. Time to test the fuse. I hooked it up to my big power supply, and cranked up the current. Yes, you read it right. 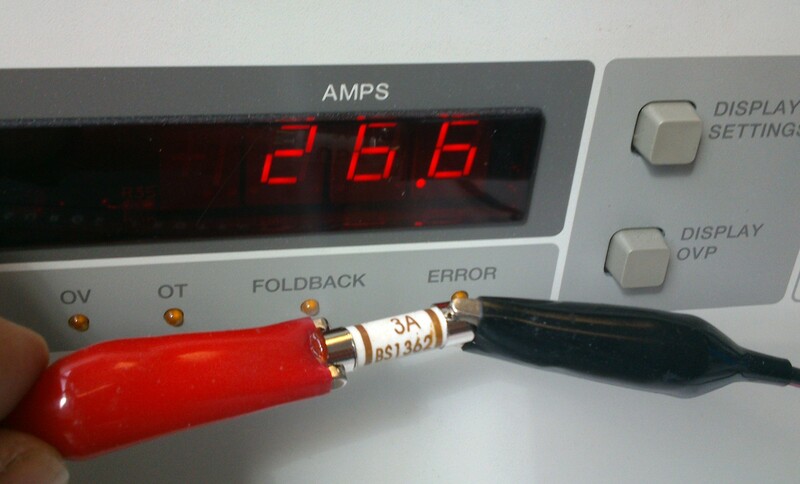 This fuse labelled ‘3A’ carried 26.6A for long enough for me to pose it for a photo, pick up the camera and press the button. It blew a few seconds later. That’s the sort of behaviour I’d expect from a 13A fuse, not a 3A one. Oh dear. My finger-in-the-air estimate of the safe current carrying capacity of this wire would be less than 1A. What a cable. The connectors on both ends (which I forgot to take a photo of) were covered with various approval logos. I can’t believe this thing met any safety standards. 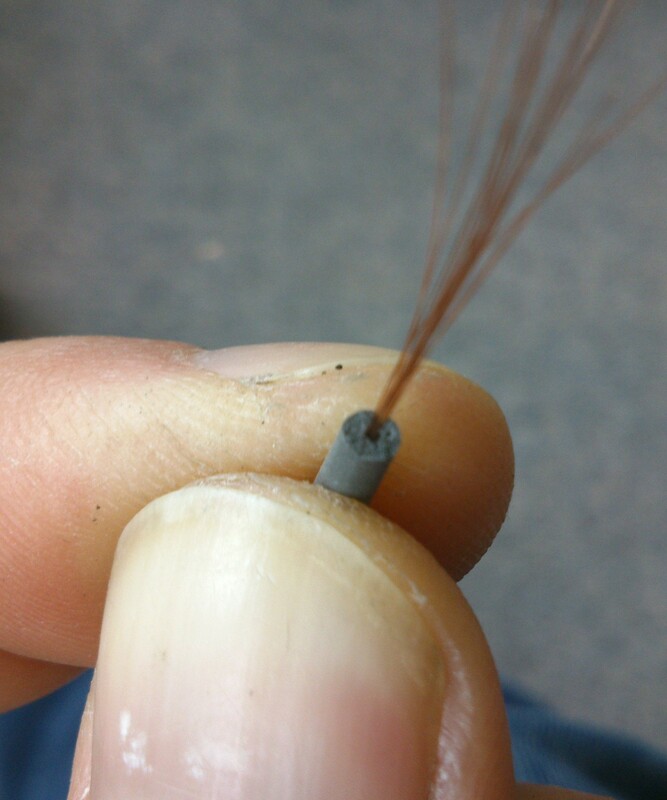 The wire itself was so weak that it could be peeled back to bare copper with just my fingers. 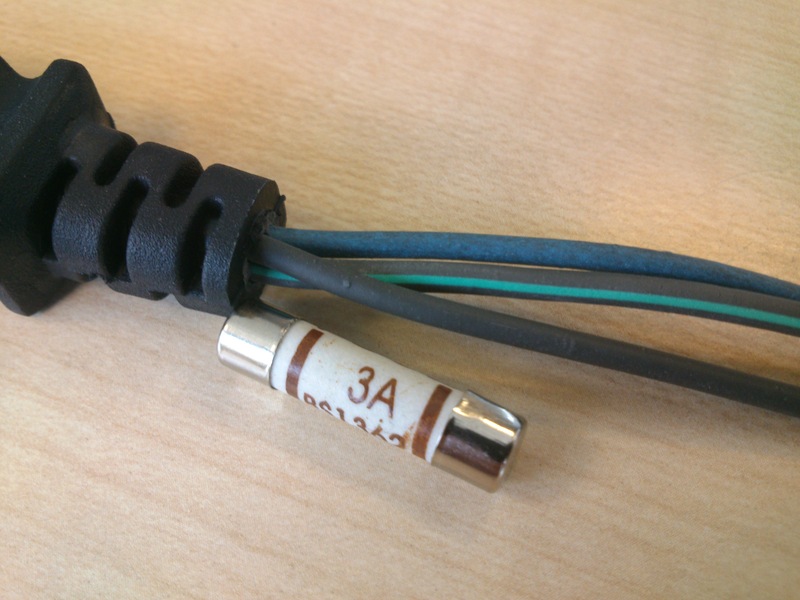 The plug fuse was mislabelled and far too large for the rating of the cable. The cable was so thin it wouldn’t handle the load that an IEC connector is designed for without dangerously overheating. If a fault had developed in the appliance plugged in with this cable, it’s likely that the cable would simply have caught fire before the fuse blew. I believe that this cable was supplied with a Chinese USB hard drive enclosure I bought a few weeks ago, but I can’t prove it. If you buy cheap electrical goods, check the mains cable carefully. I don’t know whether to call this one fake, counterfeit or just bad, but it was certainly a death trap. This entry was posted in Uncategorized and tagged counterfeit, danger, electronics, fake on April 28, 2013 by martinjonestechnology. I’ve got a couple more features of the Bubble development board working. The Micro SD card needed pullup resistors from its data and command/data lines, then it Just Worked though the card detect function doesn’t do anything yet. 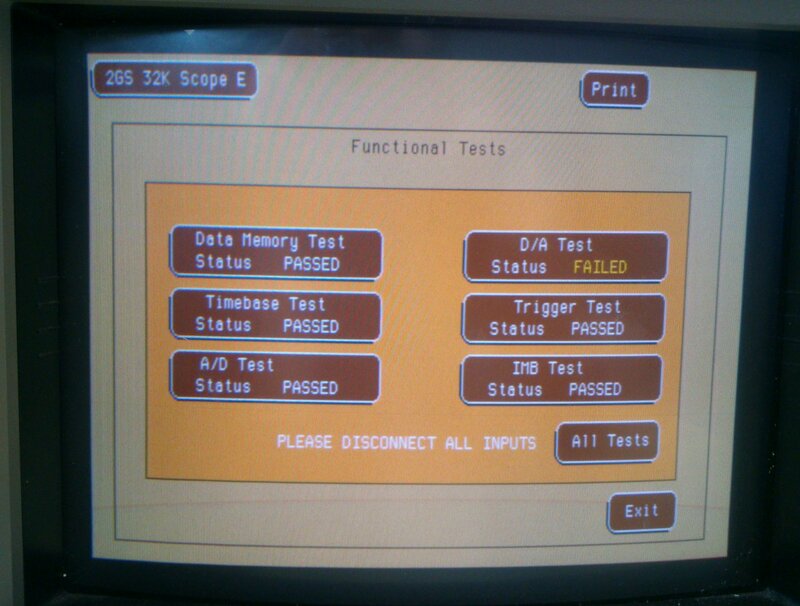 While modifying the VHDL to get Ethernet working (see below) I noticed a message that sd_card_detect has been optimised out of the design because it’s not connected to anything. That would explain it. I’ll look at it in a while. I’m not even sure whether the kernel driver supports a card detect line. Most excitingly, Ethernet works now. I’ve connected its interrupt output to a register in the CPLD and modified the platform code in the kernel to point it at the relevant interrupt, and it works! It gets an address by DHCP and I’ve successfully copied files to and from it by scp. It seems a bit slow, topping out at about 3.5Mbit/s, but the Samosa bus timing is pretty relaxed and could probably be speeded up significantly. I saw one transmit timeout message, too, so maybe something isn’t quite right yet. Oh, and the MDI/MDI-X negotiation still seems a bit unhappy so the link doesn’t come up every time. I’d also like to wire the ‘link’ output of the W5100 to a GPIO so that the driver can see it and do sensible things when the cable gets plugged in and unplugged. 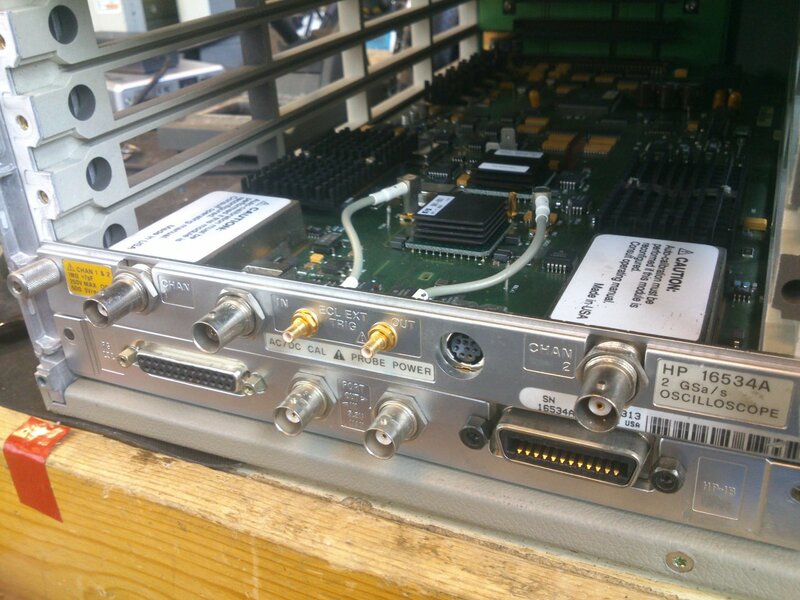 This entry was posted in Bubble and tagged ARM, electronics, embedded on April 25, 2013 by martinjonestechnology. The original version of this blog entry was published on the wrong date. You can find the correct page here. This entry was posted in Uncategorized on April 21, 2013 by martinjonestechnology. 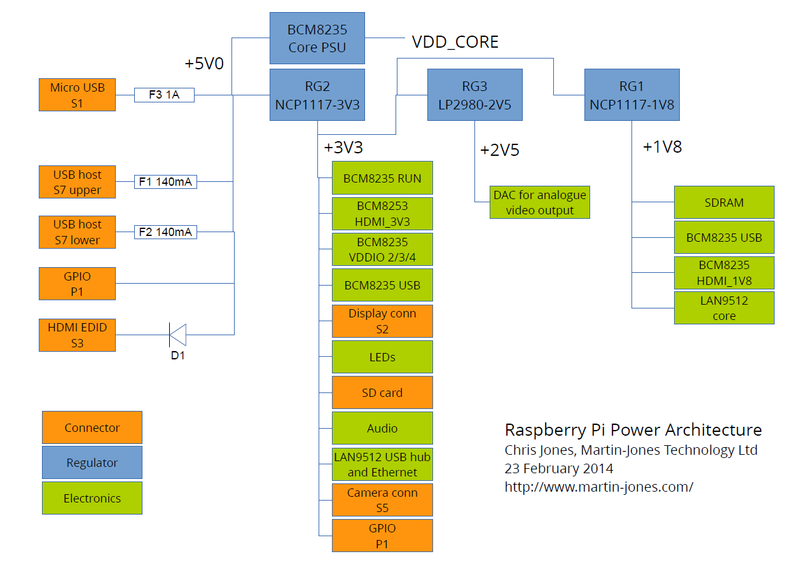 Embarking on some work with the Raspberry Pi recently, I wanted to know what its power architecture looked like. The schematic diagrams are freely available but a quick web search didn’t reveal any higher-level design documents like this, so I drew my own and here it is. I offer no guarantees of accuracy. Don’t blame me if you use this documentation and destroy your Raspberry Pi or anything else. This is not an official document. I hope it’s useful to someone. The original version of this that I posted in April 2013 had a mistake in it, which Kai kindly pointed out. The version below has been corrected. 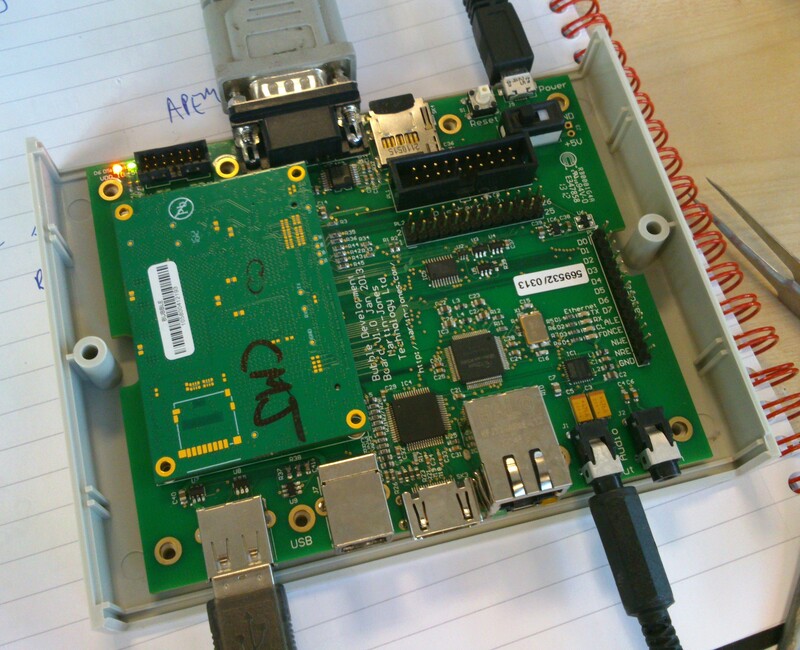 This entry was posted in Raspberry Pi and tagged ARM, electronics, embedded, Raspberry Pi on April 19, 2013 by martinjonestechnology. Having now had the Bubble Development Boards for a few days, I’ve tested a few more features. Both JTAG sockets (Xilinx 14-pin and ARM 20-pin) work with their respective dongles. The Ethernet adapter, a Wiznet W5100, is showing signs of life. If I plug an Ethernet cable into it, the ‘link’, ‘full duplex’ and speed indicator LEDs come on. Frequently the ‘link’ LED blinks continuously along with the Rx LED. I don’t know why, though searching on the web indicates that the W5100 can be fussy about the choice of transformer it’s used with, and sometimes about what kind of hub it’s plugged into – apparenly the automatic MDI/MDI-X negotiation can get confused. The tests were done with a TP-Link TL-SF1005D switch and I haven’t tried any other. Sometimes, though, the link will settle down to a steady state, then I see the Tx and Rx LEDs doing sensible things. The W5100 chip is wired to the Samosa bus with very simple address decoding so that it should appear every 4 bytes across the whole 256-byte Samosa address range. Manually poking and peeking its registers from the Bubble board’s boot loader gave sensible results, and I even managed to get it to try and send a packet, the Tx LED blinking reassuringly. and a stack trace, though the kernel carries on running. It seems that the Ethernet chip’s interrupts are not making it into the kernel. This turns out to be due to the offending interrupt line not being connected to anything in the Bubble board’s CPLD, so I’ll have to fix that next. That needs the Xilinx programming dongle which I haven’t got with me at the moment. 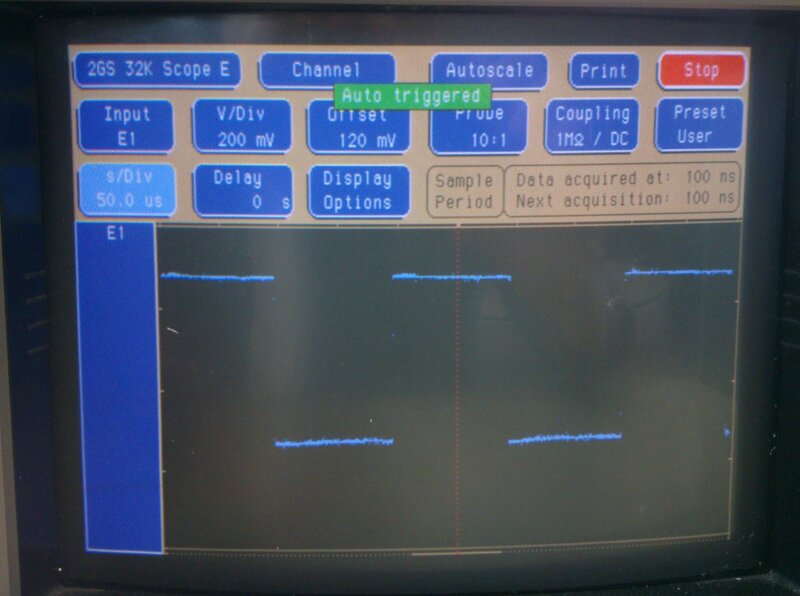 This entry was posted in Bubble, Projects and tagged ARM, Bubble, electronics, embedded on April 17, 2013 by martinjonestechnology. 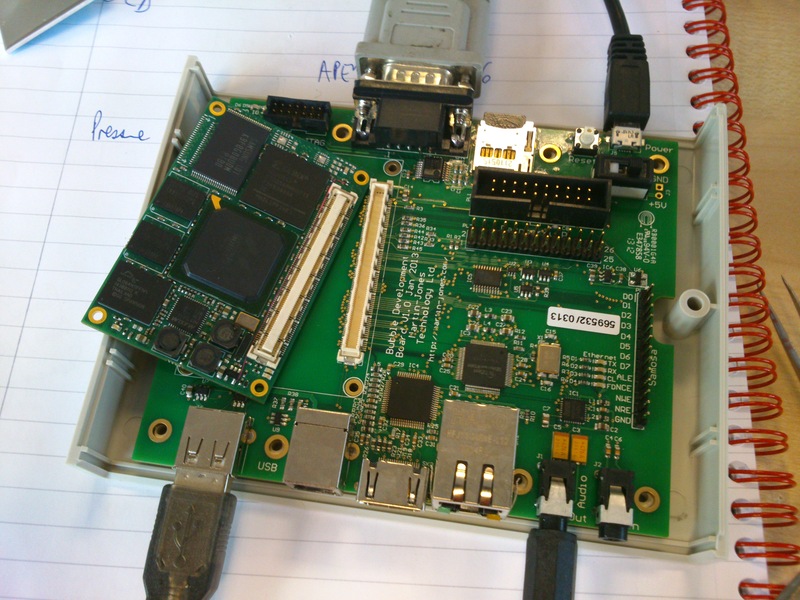 A couple of days ago I received the first examples of the Bubble Development Board and started testing them. Much to my joy, the board fits neatly into a low-cost plastic case from Farnell, part number 1526699. With front and rear panels suitably cut out, it should be well protected and easy to connect things to. But does it work? Well, yes, largely. Here are the results so far. Power: the LEDs (green for +5V input, orange for VDD_IO from the Bubble) come on and the Bubble board starts up reliably. Reset button: does what it says on the tin. USB host: tested to work with a memory stick and a USB-to-Ethernet adapter. USB slave: working. USB networking connection successfully established to a desktop PC as documented at http://www.balloonboard.org/balloonwiki/USBNetworking. Audio: output works, straight into a pair of headphones, and quality seems good with no unpleasant background noises. Haven’t tried input yet. HDMI: the Bubble board I was using was set up to drive an LCD panel, but by installing fbset and fiddling around with the settings (making them roughly 800×600, 60Hz) I managed to get a display on a monitor connected to the HDMI port. However, the image tends to disappear every few seconds and then come back again with some flickering, so something’s not quite right. I tried another monitor via an HDMI-DVI cable with the same result. Micro SD socket: not working yet. The kernel reports an error during boot and /dev/mmc* devices don’t appear. I’ve noticed that other implementations of the SD card socket from Bubble have pullup resistors on all the data and clock lines which I neglected to put on this board. This might be an easy fix because the wiring looks right. 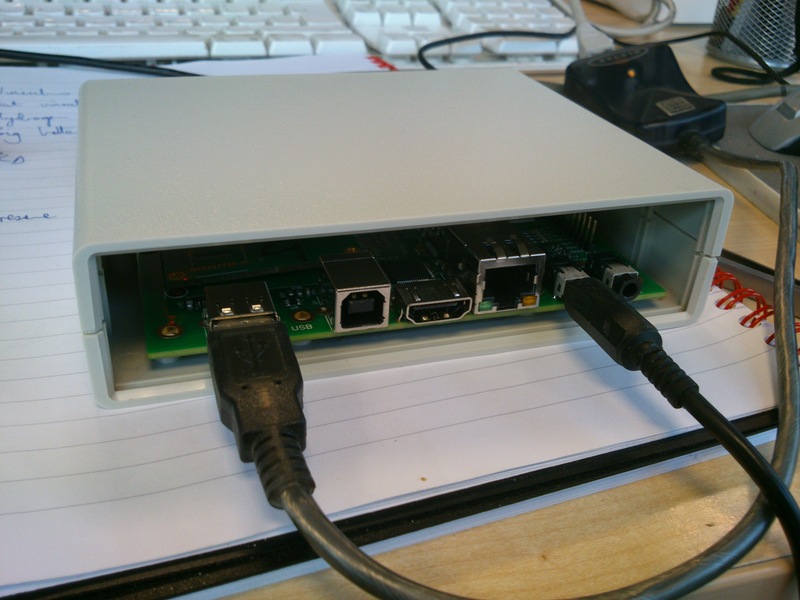 JTAG, Samosa, Raspberry Pi header, Ethernet: not tested yet. Here’s another picture with the Bubble board turned over so you can see what’s on it. 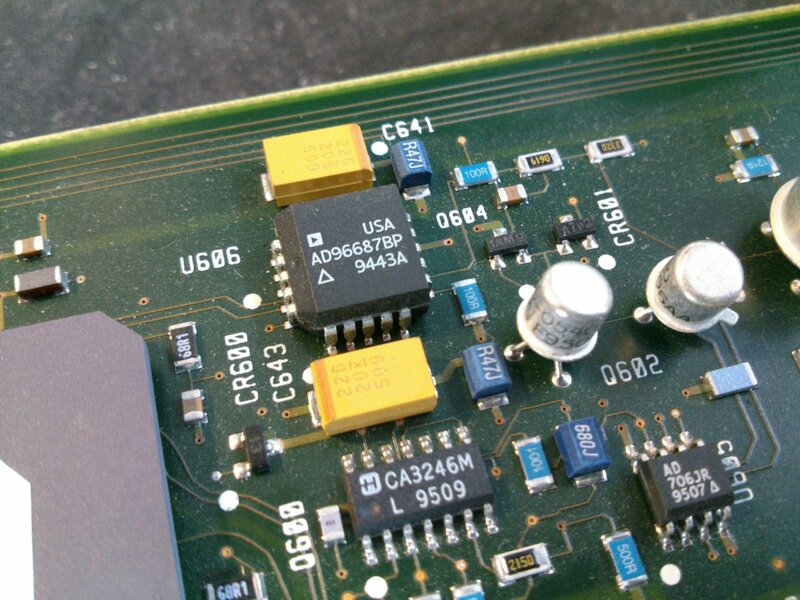 This entry was posted in Bubble, Projects and tagged ARM, Bubble, electronics, embedded on April 12, 2013 by martinjonestechnology.